Collectible Feminist Lapel Pin. Enamel Ribbon Pin. Women Empowerment. Rosie the Riveter Inspired Collar Pin. Stand with Women Pin. 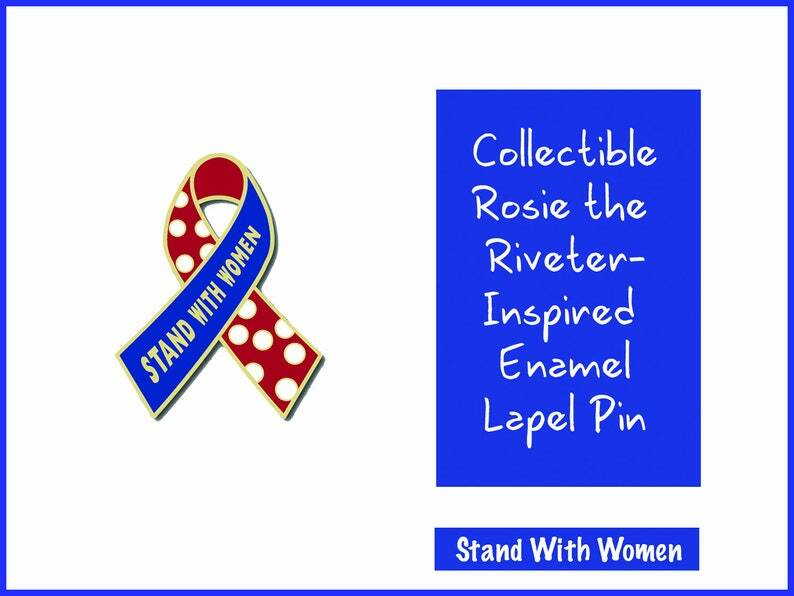 BUY THIS FEMINIST PIN for yourself or give this beautifully made Stand with Women enamel ribbon pin to friends and family. They will love it. AND, get the add-on gift box...even give us the name of the giftee, her address, and how you want us to sign your name. We'll get it right off to her. No fuss and worry on your side. Let us help you give a beautiful and lasting gift. Our collectible feminist red and white polkadot ribbon pin was inspired by the Rosie the Riveter bandana. Rosie continues to stand for strong, empowered, courageous women. If Rosie were here today, we think this is the button she'd wear on her collar. You can show your attitude, your empowerment, your awareness with this ribbon pin. Ribbon pins don't change the world, but seeing a ribbon pin raises awareness of important issues. Standing with women and helping women achieve equality is one of those issues. If you happen to be a pin collector -- or know a pin collector -- this is a great one to add to the collection of quality pins. ¶¶¶ LIKE RED AND WHITE POLKADOTS? HOW ABOUT POLKADOT SOCKS! Check out our red and white polkadot socks. Our ROSIE'S TOESIES are available in three sizes -- WOMEN, MEN, CHILDREN/YOUTH. We even changed our logo of We Can Do It! Pass It On! to She Can Do It! Pass It On! for men who want to show their support of the women in their lives -- mothers, wives, sisters, and co-workers. Designed by us and manufactured according to our high standards so that you'll feel comfortable! ¶¶¶ ROSIE THE RIVETER COSTUME? Be sure to check out the link below to our new ROSIE THE RIVETER COSTUME KIT. We include all the accessories you need to be a Rosie. You just have to add a pair of jeans from your drawer and a dark blue work shirt from your closet. We have even included a pair of our newly designed red and white polkadot socks that we call Rosie's Toesies. Read about the kit and see all that it includes! ¶¶¶ ROSIE THE RIVETER EMPLOYMENT BADGE. We have another great feminist enamel pin for you. This one is an authentic replica of the employment badge worn during World War II. Check it out. After publication of our award-winning collective memoir, ROSIE’S DAUGHTERS: The “First Woman To” Generation Tells Its Story, we were invited to give presentations. Wanting them to be fun and engaging, we decided to wear a Rosie the Riveter red and white polkadot bandana. There was nothing to be bought, not even fabric, that showcased the random pattern as seen in the “We Can Do It” poster. We set about designing an authentic bandana and had a few silk screened. We kept getting requests for them and, as they say, the rest is history. Customers asked us for the collar pin (actually an employment badge) that Rosie wore and we created an authentic replica in enamel, we added Rosie the Riveter mugs, Rosie’s Toesies (three different pairs of socks), a DIY two-sided Rosie poster, a costume accessory kit that even includes actual items from World War II, and more. We invite you to check out our store and all its Rosie the Riveter inspired products. Women have come forward many times in history to make progress for all women. Today is no exception. From suffragettes to women’s marches — from feminists to the #MeToo movement — from Rosie the Riveter to her daughters and granddaughters breaking glass ceilings and opening doors of opportunity. Today, we want to help everyone show that they STAND WITH WOMEN in all their endeavors. We offer enamel pins with messages of empowerment and strength and t-shirts with messages from women in history. If there are products you would like, please convo us. We love the ideas from our customers. RosieGrams revive the Rosie the Riveter-era tradition of handmade gifts. Need a present for a special woman in your life? RosieGram is the answer, a gift you can customize with just the items you want to include. We’ll deliver a gift to your daughter, sister, mother, grandmother, aunt, daughter-in-law, BFF or any woman you choose. Our RosieGram products are handcrafted in RosieCentral, our converted 1870 barn, where we make all of our products in small batches. During the winter months, the fire is regularly stoked and logs from a local farmer are regularly added. As the late spring and summer warmth arrives, we throw open the barn doors to welcome visitors to our retail store where we regularly schedule demonstrations of our craft. Contact us if you will be in Maine and would like to stop by for a free cup of coffee or glass of ice tea and a look around at what we do. Convey encouragement to a writer friend, Express your love. BuyBulkWholesale became a store after we had a number of requests from organizations preparing for a fundraiser, corporations planning an event, maids-of-honor getting ready for a bachelorette party, schools sponsoring an all-female robotics team, museums expanding the items in their museum gift shop, mothers or friends wanting party favors, etc. Each request was for multiples rather than singles of our items. We always worked with the group, organization, or person and created a special listing. Then we finally realized that it was time to make it more widely known that we will sell our items at wholesale. So any time you want to acknowledge strong, courageous, empowered women, consider Rosie the Riveter products or our growing line of Rosie-Made Spa Products. Meanwhile, we invite you to explore what we offer. BE SURE TO CONTACT US with the specifics of your need. In most instances, we can customize the packaging for you. ¶¶ BUY FIVE PAIRS OF ROCK YOUR DOTS ROSIE SOCKS. This store, WomensMemoirWriting, is the direct result of the publication of our collective memoir, ROSIE'S DAUGHTERS: The "First Woman To" Generation Tells Its Story. After publication, we received so much interest from women who wanted to write their own life stories that we began teaching and coaching memoir writing. Eventually, we wrote about our new approach in what became the award-winning book WRITING ALCHEMY: How to Write Fast and Deep. Over time, we added a number of products including THE [ESSENTIAL] WOMEN’S MEMOIR WRITING WORKSHOP — 21 Video Lessons; MARKET. PUBLISH. WRITE. — 9 Instructional Videos with more than 10 hours of coaching and how to material; STORYMAP: The Neverending Writing Prompt; memoir anthologies that we edited, and numerous gift products designed for women interested in writing about their lives. If you write or have a writer friend, be sure to check out our store. We ship in 1-3 business days. Feminist Pin. Enamel Collar Pin. Rosie the Riveter Wore One Just Like This in "We Can Do It" Women's History Poster. 1940s, WW2, Lapel Pin. FEMINIST MUGS 4-Pack. For Strong, Courageous Women. Coffee Mug, Tea Mug, Hot Chocolate Mug. Feminism Mug. Rosie the Riveter inspired. FEMINIST SOCKS. Show Your Support of Women. Declare You Are a Strong Woman. 3 Sizes. Red and White Polkadot Socks. Girls Rock Tees For Your Budding Feminist. T-Shirt with Empowering Message for Your Daughter or Granddaughter. Great Gift. Multiple Colors. These pins are great and arrived quickly. One of my favorite shops! Big Rosie fan. Pleased with the item got what expected and on time. The pin came really quickly and looks incredibly like the original! Plus super friendly and speedy service.